Video: The Entrepreneurial State – Mariana Mazzucato - wendykennedy.com inc. I came across this TED Talk while preparing for a workshop I am hosting at the FLC’s National Meeting, April 26th. For those of you in the publically funded research arena – federal labs, universities, etc., it provides an interesting perspective on government as the ultimate risk taker and innovation engine, and not the entrepreneurial powerhouses from Silicon Valley. Mazzucato makes the case through the example of the Apple iPhone, citing that each of its core technologies – sensors, memory, GPS, Siri, and more came from research efforts and funding support of the U.S. government. This year’s FLC theme is “From Discovery to Commercialization” – so you can expect a stimulating discussion on the topics from this video at the workshop. 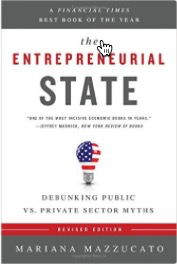 You can also purchase Mazzucato’s book, The Entrepreneurial State on Amazon.